Casting families that love to cook. Does your family love to cook? Do they also love theme parks? If so, casting directors for a TV show may want to hear all about your family’s passions of cooking and theme parks. 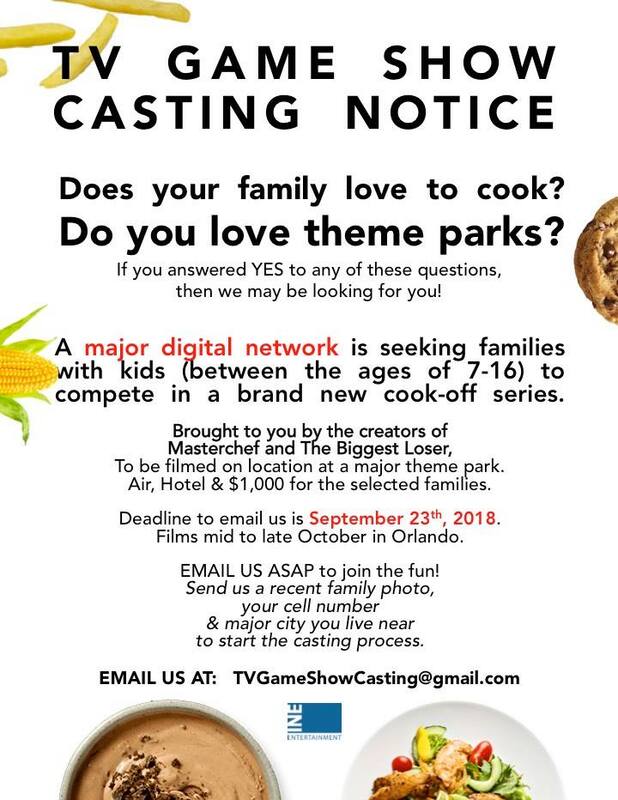 A major digital network is looking to cast families with kids between the ages of 7 and 16 to compete in a brand new cooking show. The show is brought by the producers behind such hit shows as Masterchef and The biggest Loser. By the way, Masterchef is currently casting for a new season as well. The show is looking for folks who love theme parks because this will be filmed in a major theme park. The show will be picking up the travel tab on this. Families who are cast will be paid, up to $1000 for their airfare and hotel stay as well. There is a deadline to apply to be on this show. That deadline is just a few days away on the 23rd of this month so those interested may want to rush it. The show will be filming next month in Florida. Please see the below casting notice for the submission details. Be sure to see all the other reality TV show casting listings.